The 70.2 metre superyacht Martha Ann has had a central agency change and is now jointly listed for sale with Burgess and IYC. Built in steel and aluminium by German yard Lürssen to a design by Espen Øino, Martha Ann was delivered in 2008 and refitted in 2014. Lloyds classed and MCA compliant, she has a spectacular interior by Francois Zuretti accommodating 12 guests in six cabins consisting of a full beam master suite on the main deck with a private lounge including a wet bar, a VIP suite on the upper deck and four doubles below, all with king sized beds, entertainment systems including flat screen televisions and full en suite facilities. The main saloon has a wet bar with three bar stools forward and is divided into two conversation areas including an L-shaped settee to port plus an armchair and occasional table while there is a baby grand player piano aft. To starboard are two sofas arranged in a U-shape and two arm chairs. Entertainment comes from a 110 inch home theatre projection screen drawing on the yacht’s Kaleidescape on demand visual and audio server. Forward is a dining area seating up to 14 guests that can be fully enclosed for privacy. The main aft deck of this yacht for sale is ideal for al fresco dining with two U-shaped seating areas facing each other across four occasional tables, allowing space for up to 14 guests. Meanwhile, the bridge aft deck has full width built in seating and a dining table for 14 guests, a wet bar with five stools and a large flat screen television. Other features include a sports deck with a gym and a glass elevator connecting all decks. Twin 2,010hp Caterpillar engines give Martha Ann a range of 6,000 nautical miles and she is fitted with zero speed stabilisers. 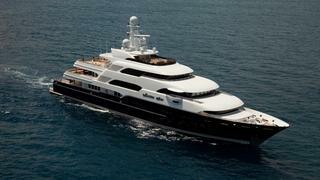 On display at the forthcoming Monaco Yacht Show, Martha Ann is asking $79,000,000.